When all is said and done it was another 0-0 draw between Liverpool and Manchester United, 12 months on from their last goalless Anfield encounter. But David de Gea’s latest astonishing save was a reminder that not all footballing works of art take place in the attacking half of the field. With Jose Mourinho again employing a cautious approach to the much-awaited fixture, there was always a likelihood that De Gea might have a big say in the result. But even the manager himself can’t have believed that his number one would deliver quite the intervention he provided in the 34th minute. 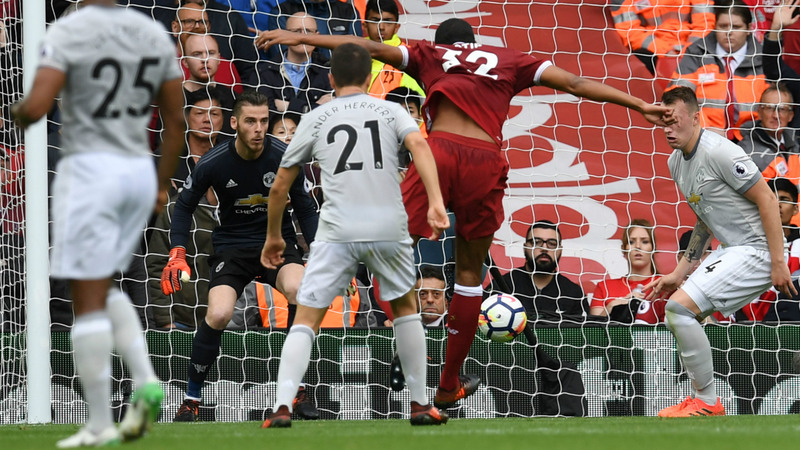 The Spaniard’s incredible save from Joel Matip proved to be the key moment in the game, with Liverpool having responded to a brief lull in the atmosphere and a momentary spell of United pressure by pushing forward once more. As Roberto Firmino squared from the left for the big Cameroonian, it looked nailed on that Liverpool would take a lead which their attacking play to that point had arguably deserved. Yet somehow De Gea was able to react within a split second to throw out his left foot and block Matip’s goal-bound strike, with Phil Jones sweeping the ball away. Mohamed Salah then ignored Philippe Coutinho’s call from the half-clearance and shot wide of the far post, ending the threat. So often supporters can be heard saying ‘If it hadn’t been for their goalkeeper…’ in mitigation when their side have failed to collect three points, and there will definitely be such a feeling among Liverpool’s fan base as they flood out of Anfield this afternoon. It is, of course, nothing new where De Gea is concerned. Between 2013 and 2016 he retained a stranglehold on United’s Player of the Year award such was his importance to the club’s ability to keep their heads above water during the David Moyes and Louis van Gaal eras. And while United's 33 goals this season have ensured greater emphasis on their attacking qualities, there has remained that constant between the sticks at the other end of the field. Some questioned whether United would be overly-affected should Real Madrid rekindle their interest in the goalkeeper last summer, with Sergio Romero having impressed in his 18 performances in 2016-17. But in truth there is a chasm between De Gea and his understudy in terms of what they add to this United side. Indeed, De Gea has few rivals these days to the unofficial title of the world’s number one goalkeeper. His ability to keep the ball out of the net – he has seven clean sheets now in eight attempts in the Premier League this season – is only the start of it. Those intangibles for which there are few statistical parameters are also areas in which De Gea excels. He commands his area superbly, he injects greater confidence in those ahead of him and what’s more his more impressive saves often come at vital times in fixtures. Liverpool had seemingly done everything they needed to do to break down Mourinho’s stubborn side, but De Gea was equal to the best they had. With Peter Schmeichel (pictured above) watching on at Anfield, the 26-year-old took another step on the road to equalling the achievements of the ‘Great Dane’. And in many ways his crucial intervention was reminiscent of Schmeichel at his most commanding back in 1996 as United supplemented their attacking prowess with a string of crucial points collected in the run-in on the way to a third Premier League title. And if United are to get back on the road to glory this season with a 21st English championship, De Gea’s wonderful save from Matip should be remembered as one of the most important moments along the way.